For those of you who are following this blog, here's the latest footage from the buzzard hide. This year has been enlightening in that there has been a definite increase in the number of crows and magpies down to the food. 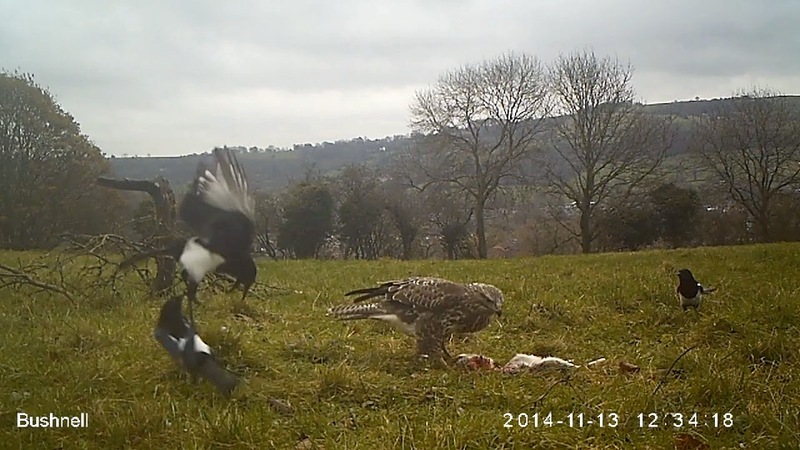 In previous years it has typically taken the buzzard to make the first move before attracting other scavengers to the food however the magpies in particular appear more bold, coming down to the food in groups of up to 6. I provide this footage as material for wildlife enthusiasts but also for photographers that are interested in making some images of the buzzards so if you know a photographer that might be interested (even if they don't normally shoot wildlife), let them know. Hide rental days also make a nice, different Christmas present and if you have any questions, just get in touch. Lastly, if you have any comments about the buzzards (or any other part of the website) I'd love to hear from you. Leave a comment below or drop me a line - I'll be glad to know your thoughts. Enjoy the weekend!